RIO DE JANEIRO, BRAZIL – A city of contradictions, extremes, and stunning beauty, Rio de Janeiro is unrivaled as to its potential as filmmaker haven. The majority of films set in Rio, such as the recent Tropa de Elite 2 and 5x Favela take on heavy subject matters and focus on complicated and controversial social issues. 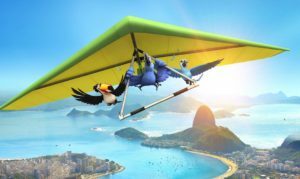 Rio, the family-friendly, 3D animation that hit the screens around the world last week, on the other hand, tells a lighthearted, uplifting story, while recreating the city on the screen with incredible precision. The dynamic between the main characters Blu and Jewel drives the story, while Rio de Janeiro's stunning views act as a backdrop, image courtesy of Twentieth Century Fox Animation. Rio tells the story of Blu, a rare, blue macaw from small-town Minnesota, who discovers that a female blue macaw called Jewel has been living in Rio de Janeiro. Blu and Jewel are as different as they can be, and the film keeps its focus on the odd coupling of the domesticated cage bird from small-town USA who cannot even fly, and the free-spirited, fearless, Carioca Jewel. Story and characters aside, Rio is a visual and musical love poem to the Cidade Maravilhosa. It explores almost every landmark of the city, making the most of the capabilities of computer generated imagery and 3D technologies. The natural beauty mixed with the well-known cultural symbols of the city create such a stunning spectacle on the screen that it delights even the long-time, jaded residents of the city. The director Carlos Saldanha, a Carioca living in the U.S., has expressed that his objective was to show the Brazilian culture and lifestyle from the eyes of an American, and he passes with flying colors. Considering that the film is a kid-friendly, feel-good movie, the positive depiction of the city is not only expected, but also welcome for anyone who is familiar with Rio. Excluding the evil characters, and the tourist-robbing monkeys, Rio succeeds in creating paradise on screen, while staying true to the reality of the city. The film has already become a box office hit worldwide, having grossed over US$173 million within its first week. It has ranked as the number one movie in the U.S., and made over US$39 million in the opening weekend; while in Brazil it has grossed US$18 million within the first week. The film masterfully recreates the samba schools' Carnival parade at the Sambódromo for a climatic scene, image courtesy of Twentieth Century Fox Animation. Along with fascinating visuals and the clever mix of Brazilian and American music that adds to the uplifting quality of the movie, the portrayal of the local people, though a bit stereotypical, is not only hilarious for those who are familiar with Cariocas, but also fascinating as to the attention to detail. Rio also attempts and succeeds in tackling some light social commentary, via pitting the small-town American and Carioca cultures against each other. The relative monotony and isolation of suburban American life clashes with the laid-back and touchy-feely Carioca lifestyle, as living in Rio means constant contact with the most extreme realities. For what it’s worth, my wife (who is Brazilian) and I saw it first in the English version with subtitles, and then “dubbed” in 3-D. We both agree the latter was much much better, the language used by the carioca characters was so much more true to life than what you heard in the English version. Unsurprising considering that the director is a native Brazilian. So if your Portuguese is up to it, go see the 3-D version, skip the English. I fell in love with Rio and Brazil in 1977 and made numerous trips to Rio and many other wonderful places throughout the country. I was delighted to discover through our family genealogist, that I had distant relations who always lived in Rio. I met them when my husband and I honeymooned in Brazil in 20090 and we stayed with them this year during the five frenetic nights of Carnaval, including one night at the sambadromo experiencing so much of what was depicted in the movie. I surely agree that the attention to the detail, which really only someone who has been to Rio many times and paid attention to sights beyond the iconography of the city, was for me the greatest joy in watching the movie. I would have appreciated watching it in Portuguese, but I did see the 3D version here in NY, which, of course, was in English. What is most heartwarming about the film is its portrayal of many of the positive aspects of Rio and the Carioca lifestyle which truly support its residents each and every day in coping with the chaos amidst the beauty. The allure of Rio, the Cariocas, and Brazil in general, is so compelling, intoxicating and seductive. This movie surely displays all of the elements that combine to make Cariocas so resilient. No one parties the way they do! I know from personal experience. I am definitely Luiz up on that float ready never to step down….from my love for the marvelllous city! For those who have never been to Rio, I am certain that it will leave them with many beautiful impressions of the people, the music, and the spectacular geography of the most beautiful city in the world! Rio is the wonderful and suspenseful movie which I had seen. We congratulate from Bangladesh to all concern with RIO for our pleased.